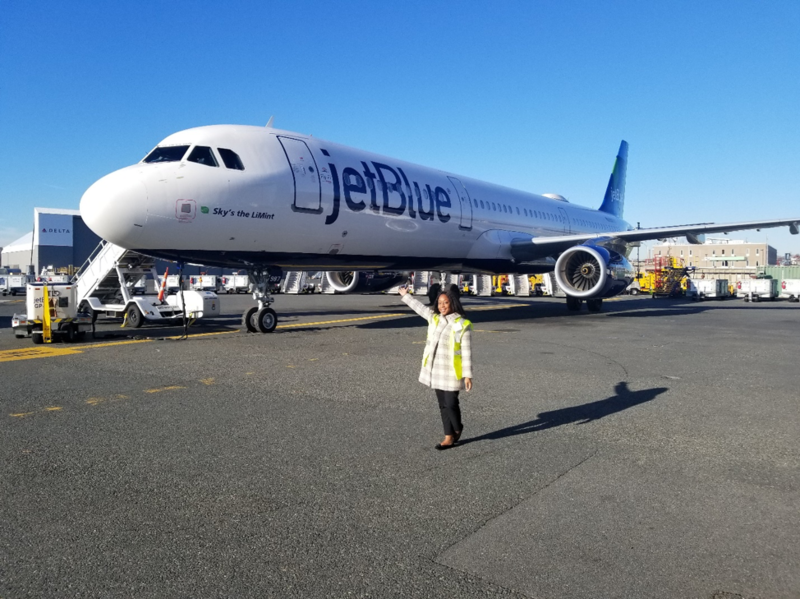 For Women’s History Month, JetBlue and the JetBlue Foundation are teaming up to profile some of the airline’s amazing female crewmembers with Science, Technology, Engineering, and Math (STEM) backgrounds who are leaving their mark on the industry. In this spotlight, we are highlighting Latoya Stacey Johnson, Analyst Strategic Planning. My interest in STEM began with a career assessment test in high school. My college advisor encouraged us all to take one and six out of the top 10 suggested career paths were in engineering fields. Candidly, I had no idea what an engineer was, but this test opened my eyes to a whole new world in STEM and I was hooked. There is no average day, but that is part of the fun of STEM. My responsibilities entail projecting the line maintenance needs of the airline for use in aligning resources and providing guidance to the maintenance planning team. I regularly validate and improve that mathematical model so that it more closely aligns with our operation. Additionally, I regularly report on our team’s performance and develop/support several tools/macros used by our tactical planning team. 3. Do you have a female role model who inspires you? When I consider role models, I immediate think of Ursula Burns who began her career as a summer intern and progressed to serve as the first Black female CEO of a Fortune 500 company. We have a similar background having grown up in an immigrant household in NYC and going on to study Mechanical Engineering. I love how she has remained authentic to herself and committed to strengthening the STEM pipeline. I am also immensely inspired by Bonny Simi as a trailblazer who has boldly gone after her goals and been unafraid to pivot in her career. She is also a strong supporter of mentoring the next generations of STEM professionals. I am currently working towards obtaining my Program Management Professional (PMP) certification. I also look forward to restarting flight lessons in the spring! Keep going! There will be obstacles and challenges, but none of those hard times mean that you are incapable or do not belong. The world is filled with resources and mentors. Do not be afraid to reach out and do not let doing so shake your confidence. My career since joining JetBlue has pivoted towards data! During my time in this role, I have and learned how to code in both R and Python and now use both regularly. Coming from an engineering background, it has been an exciting new challenge developing this skillset and exploring a different area of STEM. Develop a solid base in math and science and if things get hard - don’t confuse that for you not being good at it. Don’t be afraid to ask questions, to be bold or to be passionate. Most of all, don’t be afraid to make mistakes and learn from them. If I had to guess, I’d say representation and socialization. There are so many prevalent social cues about intelligence, appropriate behavior and math/science aptitude, not to mention just hostile environments that can dissuade girls from pursuing STEM careers and shake the confidence of women, leading them to switch fields. Exposure! I firmly believe that representation matters and girls need to see themselves in someone. They need to be able to imagine themselves in these roles and have role models who they can look to for guidance and support. I also think it is important that these role models not be held up as anomalies and geniuses; that we are candid about the work involved and speak to the challenges just as much as we do about the rewards.